....there was some speculation that it could be a hoax (the title certainly would fit), but Nathan Fillion, who broke the news, has confirmed that it's real. (Apparently he's playing Dogberry.) And then so Maurissa Tancharoen did too. And of course Whedon has spoken often in interviews of the Shakespeare reading groups he does with his friends (including people he casts in his TV projects). So I'm guessing it's legit. Update (10/25): So this news is everywhere now -- like, even in the newspaper of record. (Are they still that?) Unsurprisingly, Whedonesque is the place to go for all your MAAN news. The juciest single news source I've seen on it is this interview with Whedon, Sean "Dr. Tam" Maher and Amy "Fred/Illyria" Acker. Apparently the film is in black and white -- which is cool (I wonder if that was a purely aesthetic decision, or if it was also financial?). And it was shot entirely at Joss's own house -- which, who knew, was designed by his wife Kai, who's an architect. Amy Acker (Angel) will play Beatrice and Alexis Denisof (Angel) will play Benedict. Fran Kranz (Dollhouse) will play Claudio and newcomer Jillian Morgese (The Avengers) will play Hero. Nathan Fillion (Firefly) is Dogberry, Clark Gregg (The Avengers) is Leonato, Reed Diamond (Dollhouse) is Don Pedro. Additionally, Sean Maher (Firefly) is Don Juan (the villain of the piece), and Tom Lenk (Andrew from Buffy/Angel) plays Verges. And that's it for Whedon alums that I can see on the list. I don't know Gregg, 'cause The Avengers hasn't come out yet, or Morgese, 'cause she's a "newcomer" (how'd she get so lucky? ), but the others are all fun to imagine in their respective roles. This is a war with a difference -- a weird and beautiful difference. Personally, I feel challenged by it. I'll tell you one thing -- it's a heck of a lot more challenging than running a string of gas stations or supermarkets back in the States. -- Colonel John K. Walker, Jr. Quoted in Jonathan Schell, "The Village of Ben Suc"
Certainly, many people do join the army because they are deprived of opportunities. But the real question to be asking is: opportunities to do what? Let me offer an anthropological perspective on the question. It first came home to me a year or two ago when I was attending a lecture by Catherine Lutz, a fellow anthropologist from Brown University who has been studying U.S. military bases overseas. Many of these bases organize outreach programs, in which soldiers venture out to repair schoolrooms or to perform free dental checkups for the locals. These programs were created to improve local relations, but they were apparently at least as effective in their psychological impact on the soldiers, many of whom would wax euphoric when describing them: e.g., “This is why I joined the army,” “This is what military service is really all about–not just defending your country, but helping people.” The military’s own statistics point in the same direction: although the surveys do not list “helping people” among the motives for enlistment, the most high-minded option available–”to do something to be proud of”–is the favorite. Is it possible that America is actually a nation of frustrated altruists? -- David Graeber, "An Army of Altruists"
Not the same thing -- challenging is not the same thing as helping people -- but variations on a theme. Also relevant in this context: the fact that one reason (misguided, perhaps, but a real motive) that people go to law school is a desire to do good in the world. Is it possible that America is actually a nation of frustrated altruists? Could it be that one thing lawyers and soldiers have in common is that they both choose a poor means (if possibly the only means available to them, or that they thought was available) to try to do good in the world? This has been a post about Occupy Wall Street. It's true that, contrary to the bombast of the 1%-owned media, the message of Occupy Wall Street is clear: it's about economic injustice. (link via). But perhaps it's about more than that, too. There's an old lefty slogan that "a better world is possible". Maybe one of the things we're starved for are ways to help make it so. • Very cool story by Robert Charles Wilson, Divided by Infinity. • China Mieville's rejected pitch for an Iron Man comic. (via) I would so totally read this. • Julian Sanchez on Why do rich superheroes inherit their money while rich CEOs tend to be supervillans? Follow-up thoughts from Aylssa Rosenberg here. • Brian Leiter's five books to start reading/reading about Nietzsche. • "Ten percent of all the photos we have [i.e. the human race has now in any form] were taken in the past 12 months." • John Crowley on predicting the future. • Two fun videos of people doing impressions: Jim Meskimen Does Shakespeare in Celebrity Voices, and 50 Impressions in 50 Seconds (both via). • You know that famous quote from Zhou Enlai where he said, in 1972, that it was too early to tell what the impact of the French Revolution would be? Well, he meant the street protests of May 1968 -- not the famous Revolution of 1789. Much more reasonable, albeit less notable. • Most of Tom Tomorrow's fabulous cartoons are political in humor, and thus not linked to in this list, but this particular cartoon is not only very funny, but isn't really political at all (save in the broadest, most meaningless, "everything is political" sense). • John Varley's short story "The Manhattan Phone Book, Abridged". Via Jo Walton, who says it's like Geoff Ryman's internet novel 253. • Speaking of which, Paul Lafarge lists Ryman's 253 as one of the two hypertext novels which actually stand the test of time (so far) in his essay about why hypertext fiction seems to have fizzled (via). The other he lists is Shelley Jackson's Patchwork Girl which, alas, is not online for free, unlike Ryman's 253. Lafarge himself is in the middle of publishing a hypertext novel, Luminous Airplanes, as the companion/sequel to the just-published print novel of the same name. What They Said, a.k.a. Which Side Are You On? What they said. Keith Olbermann read the document in its entirety on the air if you're more for audio/visual. No, it's not what I would have said how I would have said it. (The footnote about how "these grievances are not all-inclusive" is about 15% cute and 85% ridiculous; I think the whole animal rights/factory farming bit was a mistake to include; and so forth.) But it doesn't matter. What matters is the movement, the overall thrust of the matter. As Kevin Drum (as anodyne and mainstream a liberal as you can find in the left-handed blogosphere) put it: Keep Asking Yourself One Question: Whose Side Am I On? Or, as Pete Seeger sang years ago: Which side are you on? Alasdair Grey famously quoted (from Dennis Leigh) that one should "work as if you lived in the early days of a better nation". Until occupy wall street, I was finding it impossible to do that. * And I think I'm not alone. If they were to accomplish nothing else (and they already have: they have changed the national conversation in ways unimaginable a mere month ago), I am deeply grateful to them for that. I myself see no possible hope on the horizon. Oh, we can fantasize about some massive citizen campaign changing things. While we're dreaming, though, I'd like a few million dollars, and a pony. Seems just about as likely. I think that 2009 may well have been this country's last chance to change course. Maybe OWS won't be that "massive citizen campaign": but maybe it will, in which case that moment of despair came even after it had already begun. (Hey, can I have my few million dollars now? You can keep the pony...) Perhaps -- just perhaps -- our eucatastrophe has begun. If not, it is at least a bit easier to imagine hope now. Last night, I glanced at the New York Times and saw the news of the deaths of Steve Jobs and Reverend Fred Shuttlesworth -- the latter of which I posted about here (or just scroll down). Then this morning I looked at the paper again -- and saw that yet another man who had done great works died yesterday: Derrick Bell, one-time professor of law at Harvard Law School. Unlike Rev. Shuttlesworth or Steve Jobs, I actually met Derrick Bell a number of times. He was a colleague of my dad's, and so I met him in all of the various ways I met the left side of the faculty at HLS when I was growing up. I didn't know him particularly well or anything -- he wasn't one of those our family was particularly close to -- but I knew him, a little bit, a long time ago. So in some ways this death strikes me even more than the other two. Of Derrick Bell, I actually have personal memories. Two occur to me now, hearing of his death. The first is a simple occasion, from when I was a teenager -- before college, anyway. Bell had barricaded himself in his HLS office in protest -- of something: to be honest, I don't remember what. Maybe the lack of African American Women Professors on the faculty, which is what he ultimately resigned from HLS over; or maybe it was something else. (Looking over his NYT obituary, I bet it's one of the occasions they describe when "in 1986, he staged a five-day sit-in in his office to protest the school’s failure to grant tenure to two professors whose work involved critical race theory.") But having barricaded himself in, he couldn't just slip out to eat; so people took turns bringing him food. And one night my family went and had dinner with him in his office, bringing the food along. Nothing particularly dramatic happened; I just recall the dinner, is all. The second is an even more distant thing. I read Bell's classic SF story "The Space Traders" (that's a link to an online version; there's a pdf here) when it first came in Bell's essay collection Faces At The Bottom Of The Well: The Permanence Of Racism, a copy of which was in my house. (I don't think I picked it up because it was SF, although maybe my Dad told me it was -- but I certainly was the sort of kid -- young adult by then, I guess -- who would have idly picked it up and leafed through it.) I liked the story, of course, but I wondered how much SF Bell had read -- it seemed like a story written by a law professor rather than an SF fan as such. So through my Dad I sent word to Bell that he should read the story "Way in the Middle of the Air" in Ray Bradbury's Martian Chronicles, which was, in an odd sense, the reverse of Bell's own story; and I got word back thanking me for pointing him at the story, which he hadn't previously seen. And that's most of what I know about him, to be honest. Aside from his SF story (which I hadn't realized had been made into a TV episode until I saw it mentioned in an obituary this morning), I haven't read much of his work -- the only thing I remember in particular is his contribution to Jack Balkin's essay collection What Brown V. Board of Education Should Have Said, an essay which displays the same despair over the possibility of ever ending racism that he expressed in "The Space Traders", and Faces at the Bottom of the Well more generally -- a despair that I felt was unwarranted, although I was and am also very conscious that that's easy for me to say as a white man living in a racist country, and that Bell's judgment was formed out of both experience and scholarship of which I have no parallel. So I don't trust my judgment on this matter -- although, somehow, it is still the judgment I have, despite that. Mostly, though, he was a friend of my parents: I met him a few times, I read some of his work, and now he's gone. And the world has one more hole in it, on a day when two too many others had been ripped open already. I hate it when it feels like I could fill my entire blog with obituary notices. Everyone dies: but, as Edna St. Vincent Millay wrote, "I know. But I do not approve. And I am not resigned." I would say that this is setting oneself up for ongoing disappointment in life -- save that life really has that taken care of anyway, doesn't it? No, I don't mean the man who designed the computer I'm typing this on, who also died today -- sure, he was a visionary too (he envisioned up this computer, didn't he? ), but he's getting front page treatment right at the moment. But just as the deaths of C. S. Lewis and Aldous Huxley were buried by the more newsworthy man who also happened to die on November 22, 1963, Jobs's death is pushing down the front page the death of a genuine American hero. And he's the one whose death really struck me. 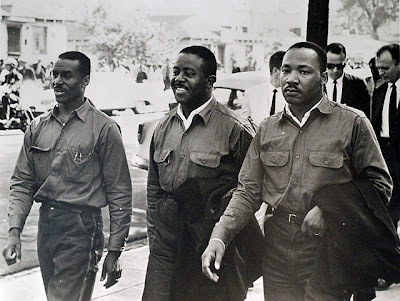 I speak of Reverend Fred Shuttlesworth, one of the founding members (along with Martin Luther King and others) of Southern Christian Leadership Conference, one of the major Civil Rights organizations during the Movement. They blew the floor out from under my bed, spaces I guess 15 feet. The springs I was lying on, we never found. I walked out from this and instead of running away from the blast, running away from the Klansmen, I said to the Klansmen police that came, he said, "Reverend, if I were you, I'd get out of town as fast as I could." I said, "Officer, you're not me. You go back and tell your Klan brethren that if God could keep me through this, then I'm here for the duration." I think that's what gave people the feeling that I wouldn't run, I didn't run, and that God had to be there. That, Noble Readers, is courage. The kind of courage that defeated a culture of terrorism such as existed in the Jim Crow South. Rev. 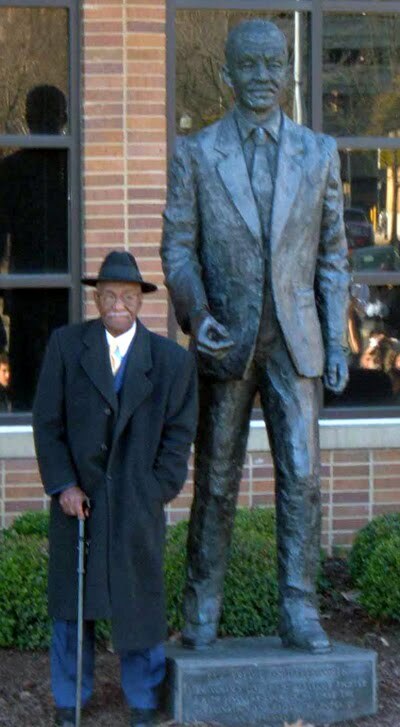 Shuttlesworth died today in his home town of Binghamton, Alabama, at the age of 89. Every American alive today owes him a debt of gratitude. "Owes him a debt...": I use language which, before having my head spun around by this extraordinary interview with David Graeber, I would have used unthinkingly -- but which, having read not only that but as much of Graeber's work as I could, I now find myself extraordinarily reluctant to use. But at the moment I haven't any other. How do you pay a debt of gratitude -- a debt to a hero who won his battles, and has now departed from the rack of this tough world? I can't help but think, in connection with Rev. Shuttlesworth's death, of the brave Americans of Occupy Wall Street, who were beaten and maced tonight by the police in New York City. (I can't shake the cynical thought that the cops thought it would be safe to attack tonight since the world would be so distracted by the death of Jobs that they wouldn't notice the attacks on those protesting the death of jobs.) They are paying it forward: by confronting, with Shuttlesworthy courage, a system which, although more amorphous, and more inclined to do its violence at a distance, is as large and intractable and cruel as that which Rev. Shuttlesworth faced down fifty years ago. May his memory give us hope, and may his example give us courage.